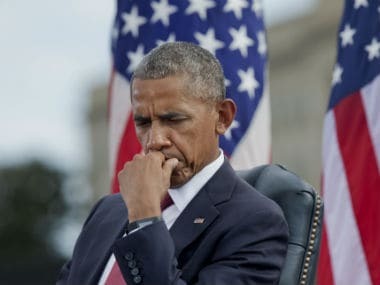 Aleppo, Syria: Responsibility for atrocities committed in Aleppo lies with Syria and its Russian and Iranian backers, US President Barack Obama said Friday as Damascus suspended the evacuation of civilians and fighters from the city's last rebel-held areas. Denouncing the "horror" in Aleppo, Obama called for impartial observers and warned President Bashar al-Assad that he would not be able to "slaughter his way to legitimacy". "The world as we speak is united in horror at the savage assault by the Syrian regime and its Russian and Iranian allies on the city of Aleppo," he told an end-of-year news conference. "This blood and these atrocities are on their hands." UN Secretary General Ban Ki-moon earlier warned that Aleppo had become "a synonym for hell" and said the United Nations urged "all necessary measures" for a safe resumption of the evacuation. The Security Council could vote as early as this weekend on a French-drafted proposal to allow international observers in Aleppo and ensure urgent aid deliveries. US Ambassador Samantha Power said after a closed-door council meeting that UN officials were ready to be sent quickly to Aleppo. "The presence of independent observers can deter some of the worst horrors," she said. French Ambassador Francois Delattre said: "The immediate priority is to save lives, to stop the massacres and to avoid a new Srebrenica," referring to the massacre of Bosnian Muslims during the Balkan wars. Russian Ambassador Vitaly Churkin, however, argued that it would take weeks to send monitors to Aleppo. Turkey and a Syrian military source said the evacuation from the city had been suspended but was not yet over, while Moscow insisted the operation was "complete", with all women and children moved from the city. The International Committee of the Red Cross (ICRC), supervising the evacuations, said it was looking into reports of shooting before the convoy was turned back. The delicate operation to bring the last civilians and rebels out of east Aleppo began on Thursday and continued overnight, with thousands leaving in buses and ambulances. State television said rebels had tried to smuggle out heavy weapons and hostages. The opposition accused the government of suspending the operation in a bid to secure the evacuation of residents from Fuaa and Kafraya, two villages under rebel siege in northwest Syria. The government and Iran have reportedly sought to add an evacuation of civilians from the villages to the terms of the Aleppo deal. The Britain-based Syrian Observatory for Human Rights said pro-government fighters had blocked the road the convoy had been using and rebels were refusing the evacuation of residents of Fuaa and Kafraya. Evacuating the last rebel pocket in Aleppo had been scheduled to start on Wednesday, but was delayed by a day because of government objections, including over Fuaa and Kafraya. Clashes resumed for several hours before the deal was revived, and buses and ambulances began transporting evacuees to rebel territory in western Aleppo province. Ahmad al-Dbis, a doctor helping coordinate the evacuation of the wounded, said at least 500 evacuees had wounds or illnesses requiring treatment. From a staging area near the town of Khan al-Aasal people were travelling further west, heading either to camps for the displaced or to stay with relatives or friends. The departures began a month to the day after government forces launched a major offensive to retake all of Aleppo and secure the regime's biggest victory in more than five years of conflict. In a video message Thursday, Assad said the "liberation" of Aleppo was "history in the making". But US Secretary of State John Kerry said what had already happened there was "unconscionable", raising concerns for the "tens of thousands of lives that are now concentrated into a very small area of Aleppo". In the dust of one bus window, someone traced: "One day we will return". "The scene was heart-breaking," said Marianne Gasser from the ICRC Syria. "People are faced with impossible choices. You see their eyes filled with sadness." A blast at a Damascus police station, meanwhile, was caused by a seven-year-old girl being sent in carrying "a bomb" that was detonated remotely, state news agency Sana said. It was believed to be the first time such a young child has been used to detonate an explosive device in the war. A police source told the Al-Watan daily that she asked to use the bathroom and the explosives detonated. Diplomatic efforts — including several rounds of peace talks in Geneva — failed to make progress in resolving the conflict, which reached a turning point last year when Russia launched an air war in support of Assad.